This entry was posted in Militarism and Christianity on March 30, 2015 by Cammy. All Catholics against militarism are invited to an event at St. Jude the Apostle Catholic Church in Sandy Springs (Atlanta) Georgia on May 2. This will be a one-day conference called “Gospel Nonviolence: The Great Failure, The Only Hope” presented by Rev. Emmanuel Charles McCarthy. All are welcome to attend, listen, and reflect. It seems most of us Catholics learn precious little about either tradition in the Church when it comes to dealing with conflict. 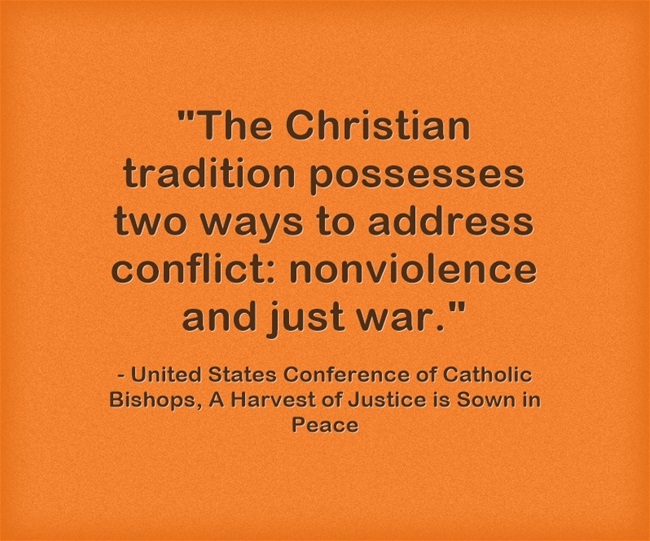 I, for one, have never heard the word “nonviolence” mentioned in a Catholic Church! I often hear the term “just war” thrown around. It is important to learn about both of these traditions, I think. Rev. Emmanuel Charles McCarthy received his B.A. and two M.A. degrees from the University of Notre Dame and his Doctorate in Jurisprudence from Boston College. He taught at the University of Notre Dame where he founded The Program for the Study and Practice of Nonviolent Conflict Resolution and he is also co-founder of Pax Christi-USA. For twenty-five years he served as Spiritual Director and/or Rector of St. Gregory the Theologian Byzantine-Melkite Catholic Seminary. 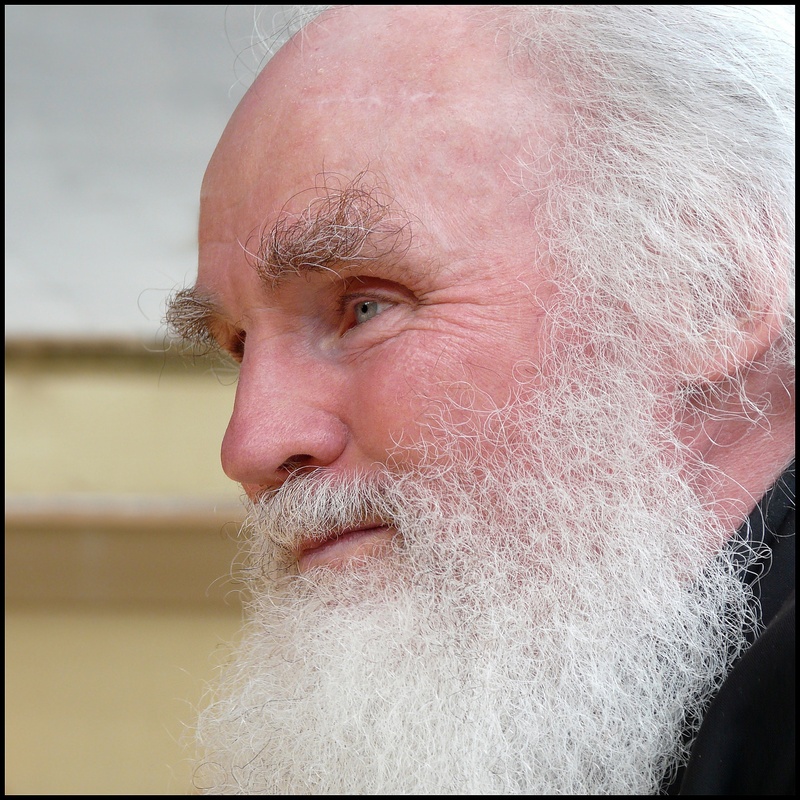 For over forty years he has directed retreats and spoken at conferences throughout the world on the issue of faith and violence. He was nominated for the Nobel Peace Prize for his life’s work on behalf of peace within and among people. He is author of several books and his series BEHOLD THE LAMB is almost universally considered to be the most spiritually profound presentation on the matter of Jesus’ Way of Nonviolent Love of friends and enemies available on CD/DVD. Please spread the word to anyone in the Atlanta area who might be interested in attending. 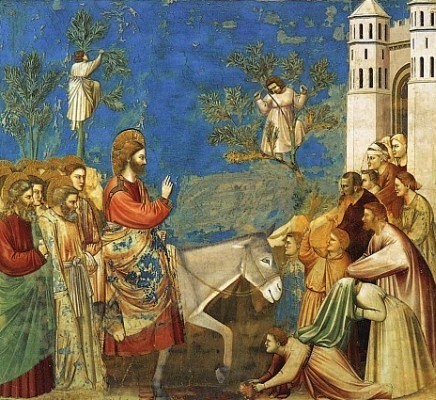 “For Christians, Holy Week is the most meaningful and most significant week of the liturgical year…The primal spiritual encounter of Holy Week—between Satan and God, evil and good, the lie and the truth, death and life, total destruction and total salvation—takes place on the historical plane as an encounter between violence and nonviolence, violent hate and nonviolent love, violent justice and nonviolent righteousness, violent retribution and nonviolent forgiveness, violent mercilessness and non violent mercy, violent wounding and nonviolent healing, violent power and the power of nonviolence, violent holy men and a nonviolent Holy Man, violent people and a nonviolent person, the violence of the secular and the religious kingdoms of this world and the nonviolence of the Kingdom of God, the violent Prince of this world and the nonviolent Prince of Peace, violent monotheism and nonviolent monotheism, the violent Cain and the nonviolent Christ, the violent sword and the nonviolent cross. 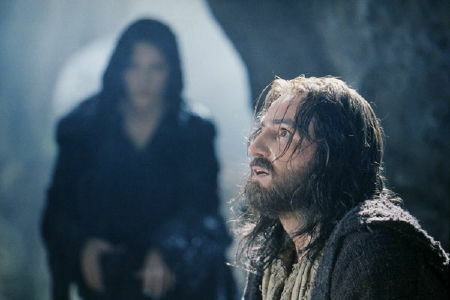 Jesus does not suffer and die quietly, in bed, from medical problems associated with old age—and there must be a reason in the Redemptive Plan of God through Jesus Christ for this. Holy Week is situated and saturated in a life-and-death battle between violence and nonviolence. Take the violence of humanly planned and executed torture and murder out of Holy Week, and there is no Holy Week. Take Jesus’ Nonviolent Love of all, of enemies and of friends, of His torturers and of His murderers, out of Holy Week and there is no Holy Week. Only God can author authentic revelation. If we do not choose to accept His Word as He communicated it, then we have no access to authentic revelation, which means we have no access to its power and wisdom. This entry was posted in Events, Nonviolence on March 30, 2015 by Cammy. Full transcript of the interview here. “They went in in the morning, a group of boys—and you’ve got to give them credit. You know, they toked the night before, and they did their whiskey the night before. They had their—you know, their drugs. But that morning, they got up thinking they were going to be in combat against the Viet Cong. They were happy to do it. Charlie Company had lost 20 people through snipers, etc. They wanted payback. And they had been taking it out on the people, but they had never seen the enemy. They’d been in country, as I said, in Vietnam for three or four months without ever having a set piece war. That’s just the way it is in guerrilla warfare—which is why we shouldn’t do it, but that’s another story. And they went in that morning ready to kill and be killed on behalf of America, to their credit. They landed. There were just nothing but women and children doing the usual, as you said in your intro—cooking, warming up rice for breakfast—and they began to put them in ditches and start executing them. Calley’s company—Calley had a platoon. There were three platoons that went in. They rounded up people and put them in a ditch. And Meadlo was ordered by Calley. He was among one or two or three boys who did a lot of shooting. There was a big distinction, basically, between the white boys, country boys like Paul Meadlo who did the shooting, and the African Americans and Hispanics, who made up about 40 percent of the company. In my interviews, I found that distinction. Most of the African Americans and Hispanics, that was Whitey’s war. The whole thing was Whitey’s war for them. And they did shoot, because they were afraid that their white colleagues might shoot at them if they weren’t participating, but they shot high. One guy even shot himself in the foot to get out of there. I mean, we had that going on, too, above and beyond the normal stuff. This entry was posted in Just War, Perversion and Propaganda and tagged My Lai on March 30, 2015 by Cammy. Rory Fanning was a former U.S. Army Ranger in Afghanistan. Fanning told me, as Musil had last year, that it is not at all easy or in some cases possible to declare yourself a conscientious objector once you are in war. This entry was posted in Conscientious Objection, Just War, Saints and Soldiers on March 28, 2015 by Cammy. In the past, I have felt compelled to catalog and record when I have seen what I felt to be evidence of militarism in the Catholic Church. It was a refreshing weekend last weekend when I attended The Church of the Blessed Sacrament as a guest on the Upper West Side of Manhattan. I should catalog also positive experiences! Instead of wincing and cringing during the Prayers of the Faithful, I was delighted and refreshed. Instead of praying exclusively for soldiers and first responders (agents of the state), we prayed for “all victims of war.” I think the word “victims” is appropriate, and of course this kind of prayer does not implicitly endorse the wars or the choice some make to participate in them. The fact that we are at war was acknowledged several times, but not in such a way that the liturgy could be mistaken for a nationalistic pep rally. The best part was that at the end of the Prayers of the Faithful, the congregation sang a brief version of “This is My Song.” It was beautiful! This entry was posted in CAM jukebox, Militarism and Christianity on March 28, 2015 by Cammy. This entry was posted in Documentaries and Film, Militarism and Christianity, War and Peace on March 26, 2015 by Cammy. I wish I had heard even one homily like this on a Sunday in the last 14 years, just one. But I haven’t, which is part of the reason we started this site. That is too much. It was deemed offensive and disrespectful. He was fired. When the kinds of questions he is asking become too controversial for American Christians to tolerate, I think that is a sign that something is wrong, very wrong. Too many American Christians want certain topics to be considered “off limits,” as in “you can’t go there” or “it is wrong to question this.” Violence and war (and participation in war) is the number one topic that they want deemed “off limits.” It seems quite clear to me that they are afraid of the questions: If you ask the questions, they might lead you to the “wrong” conclusions. But it is never “wrong” to question anything! Inherent in the Christian faith is an ongoing attitude of self-criticism, self-critique. This applies to both our own souls and our country at large. Our religious leaders garner much praise, love and support when they unite us as Christians (and Americans) by demonizing and vilifying the “other,” whether that “other” be Muslims, liberals, secularists, terrorists, Obama, etc. We feel edified and strengthened through opposition, enmity. But when they urge us to look at ourselves, and within ourselves, we no longer feel united in self-righteousness and mutual admiration and self-congratulatory celebration for our collective awesomeness: We feel disharmony, disagreement, self-doubt, and maybe even if we let ourselves “go there”…shame? guilt? And how can a country stay strong and united if our leaders make us question our own awesomeness? We kill the messenger and feel safer. With that scary voice silenced, we can once again relax, comfortable and settled with our self-justifications. Sermons like this in civilian life are rare. They are dangerous for the one who delivers them. So, can you imagine a military chaplain giving a sermon like this? All of the pressures that already exist for our religious leaders — pressures to be popular, to be PC, to be accepted and loved by everyone — all of those pressures are only increased exponentially in the even more militaristic culture of the military. This story apparently became popular over on Reddit, where it made the front page by attracting readers’ attention and receiving over 500 comments. I would like to know what became of this story and whether the Chaplain got his job back, but a quick Google News search shows only exactly one search result: the original story. Apparently, no mainstream media outlets, local or national, have found this story worthy of reporting? This entry was posted in Archdiocese of Military Services, Campus Action, Militarism and Christianity, Speeches and Sermons and tagged chaplain, Randy Beckum on March 22, 2015 by Cammy. My name is Husan and I was from Kabul. When the killers painted their name on that shell. The day Papa was killed during Russian rule. A boy of just four, I could not read nor write. When I brought the shell to my Meme that night. Why the foreign tribe of Medina-Ussah would. Murder and kill an innocent peddler without pity? Why would they do this to my home land? And take the name of Muhammad’s Holy Land? Years later, the Medina-Ussah returned. When I was at school, and Meme at table. Except for that label, everything had burned. As an orphan in the land of Peshawar. Though I learned English there, I still didn’t see. At a madrasa under the Taliban. Murder and kill my innocent Meme without pity? My only son would have turned eight yesterday. With that evil tribe’s label in the blast crash. It was an accident, so officials say. Bombed the child’s school and painted their name on top. The same words I showed Meme in our bombed shop. And I read English, or my friends say I can. So with all my might, I still don’t understand. Why all the killing and the drone strikes unmanned? Collateral damage, the evil tribe’s brand. But they still murdered and killed without pity. Why would they do this to my new land? Why does “Made in U.S.A.” take such a stand? Tom Eddlem writes for The New American and he is a U.S. history teacher in a Catholic high school south of Boston. This entry was posted in Poets and Poetry on March 20, 2015 by Doug Fuda. 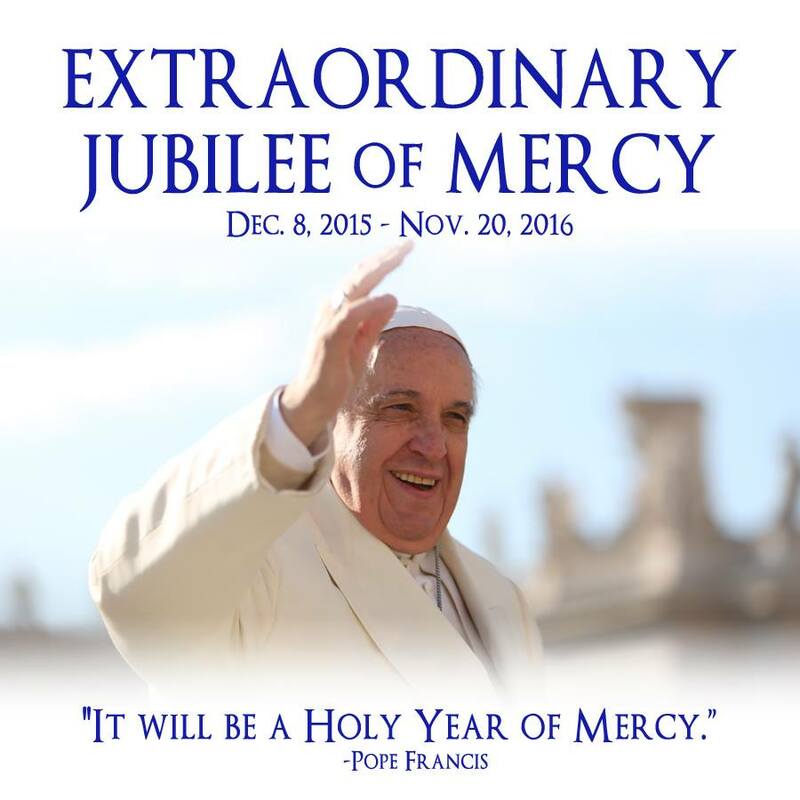 Upon the announcement of a holy year of mercy to start on December 8, 2015, some recommended reading: Dives in Misericordia (Rich in Mercy), Pope John Paul II, November 30, 1980. This entry was posted in Uncategorized on March 19, 2015 by Cammy. 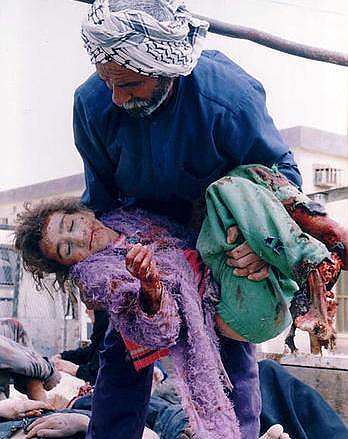 Father holding daughter in Fallujah. This entry was posted in Perversion and Propaganda on March 17, 2015 by Cammy.